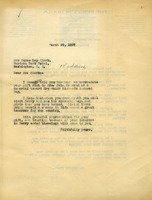 Martha Berry writes to thank Mrs. Clark for the gift sent by Mrs. Hammond towards an endowed day for Mrs. Waldo Richards. She hopes that they will visit Berry when they come south. $100 gift for the Mrs. Waldo Richards endowed day. Gift facilitated by Emily Vanderbilt Hammond. Mrs. Walter G. Ladd sends $200, sent in by Mrs. Hammond for the Mrs. Waldo Pratt Richards endowed day. 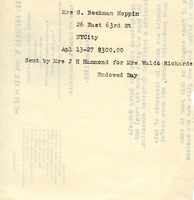 Mrs. G. Beekman Hoppin sends $300, sent by Mrs. J. H. Hammond for Mrs. Waldo Richards' Endowed Day. Mrs. William B. Osgood Field sends $100 to the Berry Schools. The check was sent from Mrs. Field to Berry by Mrs. Hammond for an endowed day for Mrs. Waldo Richards. 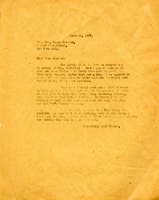 E. B. Maguire, secretary to Mrs. Hammond, writes to Miss Berry, sends $300 for two scholarships in the name of Gertrude Moore Richards and tells Miss Berry that Mrs. Hammond is probably send more money for scholarships in surplus of the endowment fund.